Please let the cursor hover over the option headers ([?]) for hints. NUPARM-Plus is a program to analyze and characterize overall geometry of input double stranded helices. This program can be very useful in understanding sequence directed structural variations in nucleic acids. It can also be used in the modeling of nucleic acid helices, analysis of molecular dynamic trajectories of structures containing double stranded helices etc. This web server version of NUPARM-Plus uses JSMol (JmolApplet) to display the double stranded helices along with their axis, in the same orientation as that in the input pdb file. BPFIND will be used for identifying the base-pairs. BPFIND Will be used for identifying base-pairs. DSSP assigned alpha helices alongwith Pi & 310 helices (length greater than 6) will be considered for HELANAL-Plus run. 5' to 3' nucleotide number along with the corresponding chain ID for both the strands of a duplex should be given in the format 21:A (21 is nucleotide number and A is chain ID). Only Watson-Crick base pairing will be assigned to the base-pairs. Helix Information available in the input PDB file will be considered for the HELANAL-Plus run. Base pairing information of more than one duplex can also be provided. Each duplex must be terminated by a line consisting of " 0" (four spaces). 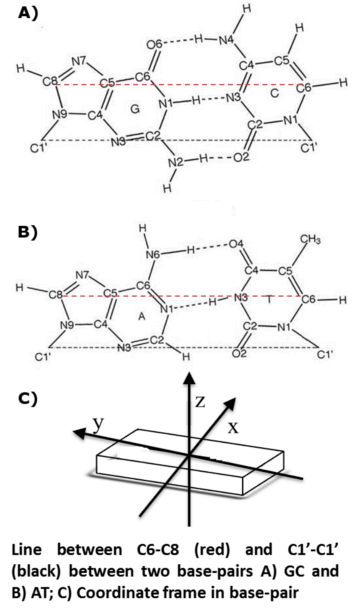 The uploaded 3D coordinate file must contain only the constituent atomic coordinates of nucleic acids. Nucleotide numbers given in the uploaded duplex information file will be considered as the serial number of the nucleotides in the uploaded coordinate file. Details can be found in the help page . Are Cylindrical Polar Coordinates required? Is the Backbone and Sugar torsion angle parameters required? Are Single Strand parameters required? Questions or problems regarding this web site should be directed to [mb@mbu.iisc.ernet.in]. Copyright © 2010 [Molecular Biophysics Unit,IISC]. All rights reserved.